Governments and NGOs should reject the simplistic debate choice, that it’s either drug legalization or a war on drugs, concludes FORUT in a new drug policy publication. Instead, they should focus on the “third way”; a broad, balanced and human drug policy within the framework of the existing UN drug conventions and with prevention as priority number one. 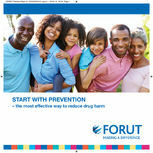 FORUT has now published a new thematic paper presenting the organisation’s views on effective drug policies; titled “Start with prevention – the most effective way to reduce drug harm”. The new booklet will be FORUT’s input to the ongoing UNGASS2016 preparations. A low-resolution version of the booklet can be downloaded here. You can view the booklet by clicking here. FORUT states that prevention and keeping drug use prevalence low is the most effective and humane way to reduce harm from drug use. It is the most cost-effective policy option; it is a sustainable and people-empowering strategy; and it is in the best interest of the world’s children. Being a development NGO, FORUT naturally has a focus on development aspects of drug policies. “Development perspectives deserve far greater prominence in global drug policy discussions, including in the UNGASS process”, it is said in the introduction of the booklet. “For far too long global drug-policy discussions, including the UNGASS process, have inadequately considered the conditions and needs of populations in developing countries. Those discussions have often been dominated by Western experts focused on Western solutions to Western problems, now strongly influenced by a well-organized legalization movement. The resulting dialogue has little to do with drug use issues in the global south and, to a large extent, also fails to reflect drug realities in much of the West. Simply stated, the poor and marginalized people of the world need no additional burdens beyond the considerable ones they already bear. Their protection from drug harm is uniquely important because experience shows that substance use, whether legal or illegal drugs, has stronger negative consequences for poor and marginalized people than for those in more affluent groups”. FORUT challenges all countries to strengthen and expand their health services to assist people with acute drug problems or drug addiction. In too many countries today such services are almost entirely lacking. On the other hand, says FORUT, one must be realistic about how large a role health services can play in a national drug strategy. Not even the world’s richest countries – those with highly developed public health services – can afford treatment systems capable of assisting all those in need; particularly given the widespread and heavy use of alcohol or narcotic drugs in those societies. Tackling the consequences of an increase in regular narcotic drug use, in addition to the massive harm caused by existing alcohol use, is generally far beyond the capacity of health services in all nations. That reality is far more evident in many developing countries, where the health service systems are already overwhelmed by the typical diseases of poverty, including malaria, TB, and malnutrition.